Rabbi Sandy Rosenstein and congregation members. Are you interested in joining Temple Beth Sholom of Temecula? We look forward to welcoming you to our congregation! As a Conservative Synagogue, our approach is a more modern, inviting atmosphere that relishes its own diversity. 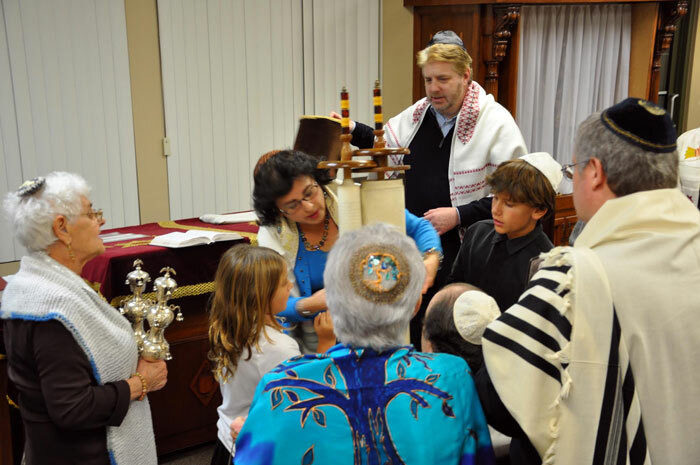 Whether you come from a more traditional Jewish background, are part of an interfaith family, or just beginning to get in touch with your Judaism- Temple Beth Sholom of Temecula is right for you. Shabbat services are held weekly by our very own, Rabbi Sandy Rosenstein, who always delivers a vibrant and deeply meaningful sermon as we bring in the Sabbath. Additionally, as a member you will surely not want to miss out on our many programs, such as adult education on the Talmud, beginning Hebrew classes, movie nights, and hiking excursions. Please note: You will need to have Adobe Reader installed to open the PDF. If you do not have the software, you can download it for free here or at http://get.adobe.com/reader/. If you have any issues downloading the form or have any questions, please contact us.